In the early Han Dynasty (漢朝) (206 B.C.–A.D. 220) of China, there were the “Five Punishments” of which four were severe corporal punishments. This part of the penal system was once widely imposed during the previous Qin Dynasty (秦朝) (221–206 B.C.) and was retained in the new dynasty. The four forms of inflicting bodily harm were generally accepted by government officials as appropriate retribution for criminal offenders. These included amputations of the nose, ears, or limbs, or the face being tattooed to indicate conviction. However, due to the courage of a brave, teenaged girl, such brutal and inhumane practices were abolished under the reign of Emperor Wen of Han (漢皇帝). That young girl was Ti Ying (緹縈). Ti Ying was the youngest of the five daughters of a doctor named Chunyu Yi. Her father worked initially as a low-ranking official, but later became a physician of high rank after he completed study with a famous doctor. Rather than devoting himself solely to treating the nobility, Chun Yi roamed the countryside offering his services to the common people. He enjoyed an exceptional reputation for his medical skills and was sought after by many people. Chunyu Yi took a very realistic and scientific approach to medicine and was honest about his own errors and failures in diagnoses and treatments. However, when Chun Yi failed to save the life of a very wealthy man’s wife, a woman already gravely ill, the devastated husband resented and incriminated him, claiming that Chunyu Yi’s treatment was the cause of his wife’s death. The man was very influential and soon Ti Ying’s father was charged and, without an investigation, was sent to the capital to face a corporal punishment befitting his station. Once at the capital, she begged a scribe to draft a petition for her, addressed to Emperor Wen, and she herself handed it to the palace guards to give to the emperor. When the emperor heard that a grievance had been sent by a very bold, young girl, he was eager for it to be read. In her letter, she stated: “As an official, my father was loyal to his duty, and as a physician he saved so many lives. He has been praised by people for his integrity. He now faces severe corporal punishment due to a false accusation. “Once a man is executed, he cannot come back to life. Once a man is mutilated, even if he proved to be innocent later, he would be disabled for life, and there is no way to reverse the suffering he experiences. Even if he wishes to start anew, he will be unable to do so. Ti Ying’s petition not only requested her father’s pardon but also pointed out the unjustness and cruelty of corporal punishment, in general, and how it did not allow those convicted a chance to rehabilitate. Her reasoning was so well presented that court officials were impressed by her eloquence. Emperor Wen was deeply moved by Ti Ying’s plea. He was also amazed by the young girl’s courage, as she was willing to endure hardship to accompany her father and she was willing to commit to a life of slavery in exchange for another’s well-being. 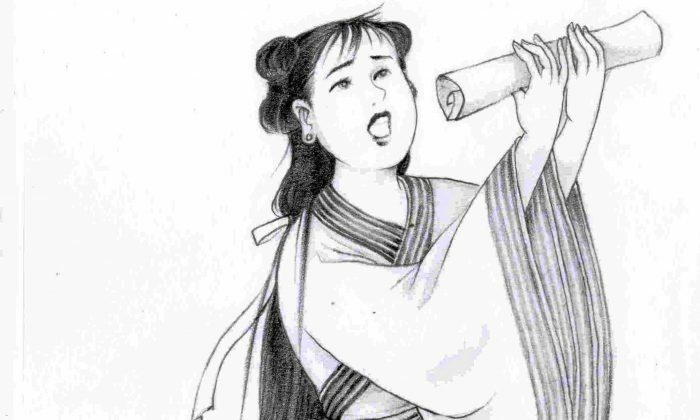 Not only did the emperor decline Ti Ying’s servitude and pardon her father, he also took the young woman’s words to heart and abolished the cruel corporal punishments.